Today's featured product that will help your skin to make it through the colder months ahead is 100% Pure's Strawberry Lemonade Body Scrub. 100% Pure's Body Scrubs are natural fruit oil-based sugar scrubs, and they're available in a wide variety of scents. These scrubs are packed full of natural fruit oils to nourish and hydrate your skin. Right now, you can use the code EXFOLIATE to receive 20% off of all body and face scrubs through midnight tonight. The natural fruit oils make this scrub very hydrating, but I do find that it leaves my shower/tub a bit slippery after using it. The scrub itself does a great job exfoliating your skin, and it makes me feel completely moisturized when I get out of the shower. The scent has a nice sugared lemonade aroma with a very light hint of strawberry. It smells wonderful while you're using it, but the scent doesn't linger on your skin or interfere with other scents you may apply after usage. Hint: Use this outside of your shower or bath too! This tub is huge at 15 oz., so I transfered some of it to a smaller jar and keep it on my kitchen sink for a quick exfoliating and moisturizing treat for my hands and cuticles. It looks like a Slushie! As I mentioned, this product is packed with natural fruit oils, so I normally give the jar a good shake before using it to get the oils mixed in. You'll notice when you first open the jar, that the oils are at the top of the product. 100% Pure products are all natural and cruelty free. You can sign up for their eMail newsletter to be alerted of all of their specials, and you can find that at the bottom of their main page. 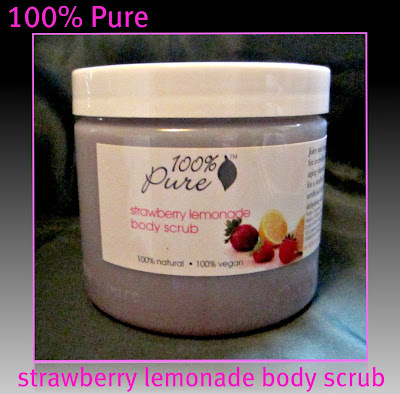 Giveaway: One follower will win a full-sized tub of 100% Pure's Strawberry Lemonade Body Scrub! Just leave your eMail in the comments below as your entry, and I'll leave the entry period open until Monday morning (11/14/11), at which time the winner will be announced in my Come Monday weekly newsletter. Note: Because the prize will be shipped from the manufacturer, this contest is only open to residents of the United States. *Product featured and prize furnished by the manufacturer. I love bath products. 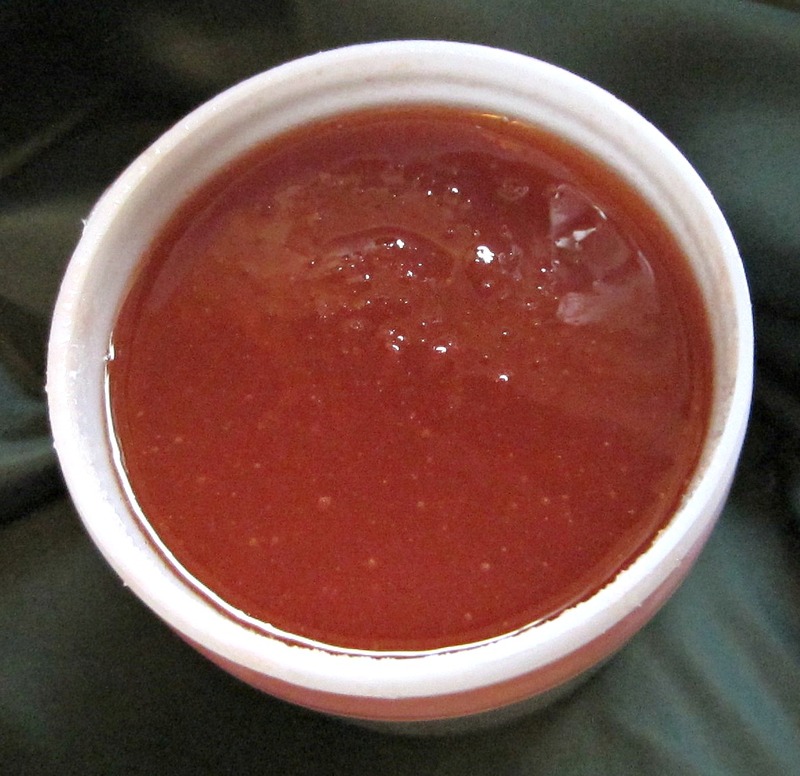 this scrub looks perfect as the weather gets colder and our skin needs to be exfoliated more. Before I read the "slushee" bit, I automatically thought "Oooh, Slurpee" and eyed the 7-11 across from my office. XD I love scrubs. I'd love to try this. Sounds yummy! The scrub sounds so yummy. I bet this smells heavenly. Thanks for this giveaway. That sounds and looks good enough to eat! this is one of my favorite all-time products- I REALLY hope I win! Thanks!!! Now I need some strawberry lemonade! I have really dry skin in the winter, I'd love to try this! This scrub sounds good enough to eat! Oh wow! That sounds like an amazing scrub. Thanks for the gieawa! My skin gets so dry in fall and winter! The name sounds like it would smell yummy & 100% Pure Products rarely disappoint!